Duns RFC visited one of their nearest neighbours for this East Division 1 fixture on Saturday. There was a brisk and cold cross-field wind which persisted throughout the game and made life difficult for the kickers on both sides. The visitors were put under pressure from the kick-off but their defence responded well and they held out until midway through the half when an infringement at the breakdown gave Dunbar a penalty opportunity which they converted. Duns came back strongly and were unfortunate when their flanker John Walker was yellow-carded. 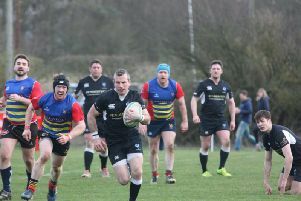 They continued to press with 14 men and scrum-half Danny Lamb forced his way over the try-line from a five-metre scrum for a score, which was not converted. The first half finished with Duns ahead 5-3. The second half began with Dunbar again in the ascendancy and despite some stout defence from Duns they added to their tally when they put the ball through the hands in their back-line and scored a try in the corner. The visiting supporters thought one of the passes looked suspiciously forward but that was, perhaps, wishful thinking. Now three points behind, Duns scrambled their way back into the game following some pressure of their own and when Dunbar were penalised at a ruck reasonably close to the posts and Toby Culham was successful with the kick. This levelled the scores at 8-8 and the remaining 20 minutes were very closely contested. Late on Duns gave away a penalty near their own 22 and, heart-breakingly for the visitors, this was converted with the last kick of the game. Although they lost by 11-8, Duns could take some satisfaction from what was one of their best performances of the season so far, and this in an away match against a side currently in a much higher league position. Duns: Stuart Thomson; Scot Maceachen, Toby Culham, Dale Robertson and Callum Redden; Ewan Fleming and Danny Lamb; Scott McCraw, Cammy Hill, Andrew Connor, Gavin Tait, Steven Markby, John Walker, Bert Grigg and Lewis Craik. The replacements were Scott Turnbull, Euan Reed and Chip Brailsford.